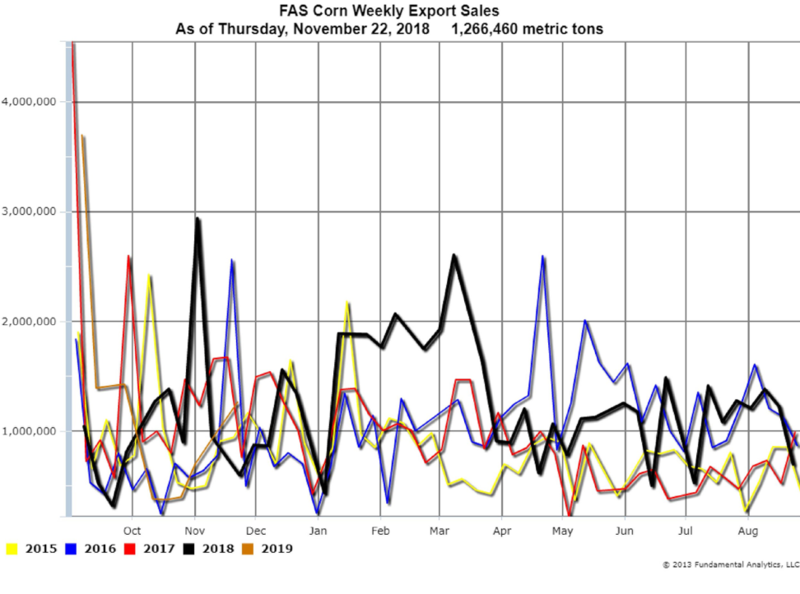 The FAS Weekly Export Sales report last Thursday shows Corn Weekly Export Sales for the week ending November 22, 2018 at 1, 266,460 metric tons (Chart 1, 2019 orange line). This was greater than the estimates of 400,000 – 600,000 metric tons. 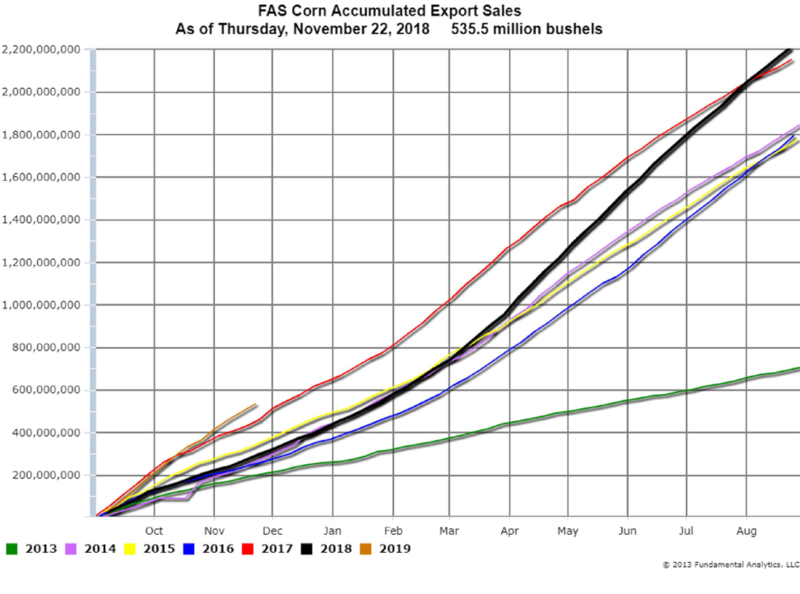 It is more impressive to view the Accumulated Exports for the new market year at 437.8 million bushels (Chart 2, 2019 orange line). Export demand is strong, and that is reflected in the rising prices. We suggest consideration of a long position in the Corn March – July calendar spread or other similar spreads. 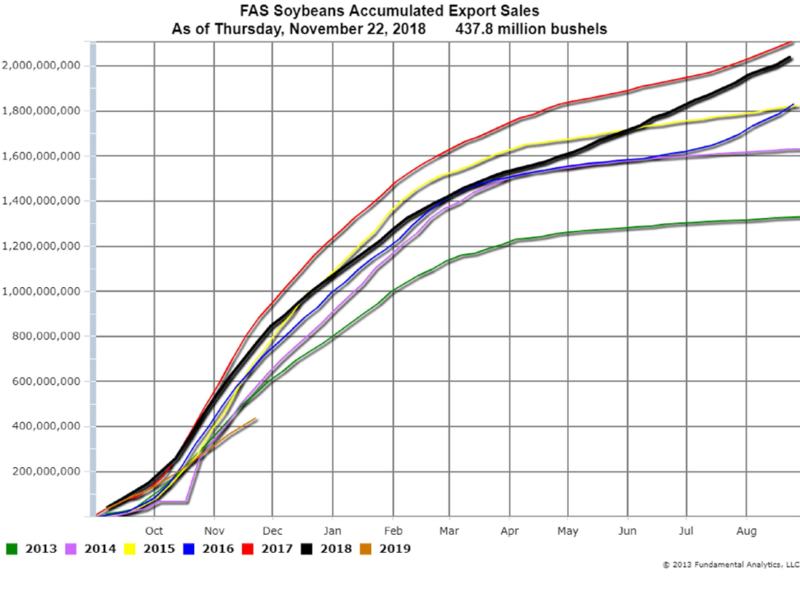 In contrast to corn, the FAS Weekly Export Sales report shows Soybeans Weekly Export Sales at 628,783 metric tons (Chart 3, 2019 orange line). 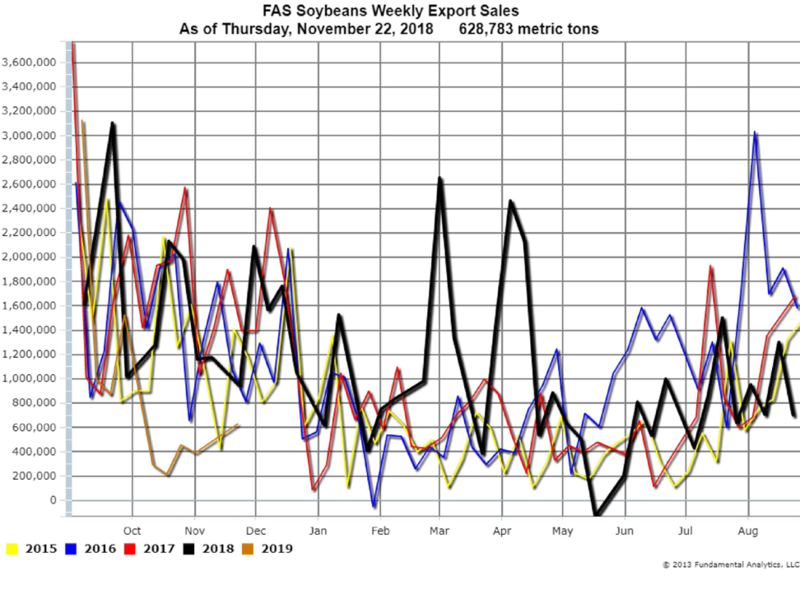 The Chinese import tariffs have significantly reduced US soybeans exports. The Accumulated Exports at 437.8 million bushels (Chart 4, 2019 orange line) is the lowest in the last 6 years. Normally this would indicate lower prices, but President Trump and Chinese president Xi Jinping at the G20 meeting agreed to a 90-day moratorium on tariffs. According to the White House, the Chinese have agreed to buy an unspecified but “very substantial” quantity of agricultural products. Prices in both corn and soybeans gapped up at the opening of trading Sunday night. Due to the large amounts of soybeans in storage, soybean calendar spreads are at the lowest values in several years. It is too early to know if exports will now recover so that the calendar spreads increase. We recommend remaining on the trading sidelines until a few more weeks of data are released to assess the effects of the tariffs moratorium. 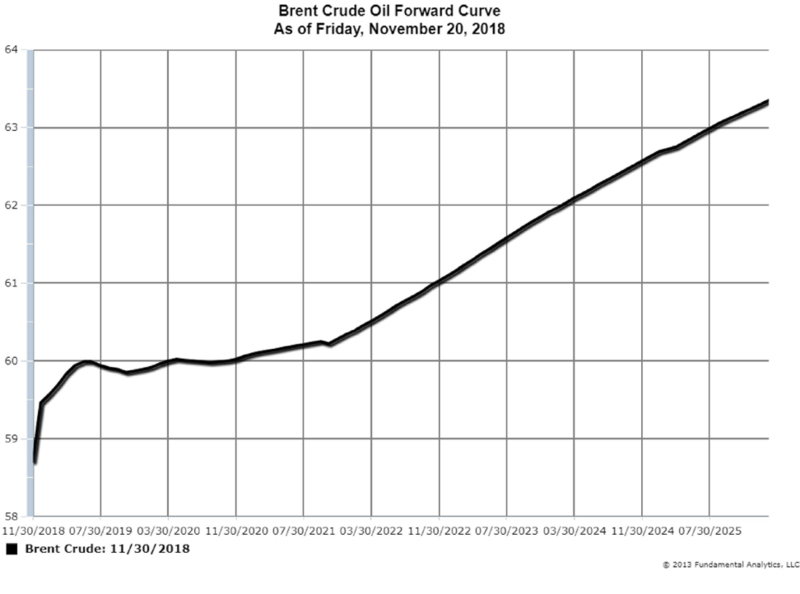 The collapse of Crude Oil prices in the last two months is reflected in the forward curve of Brent Crude Oil (Chart 5) and more dramatically in the forward curve of WTI Crude Oil (Chart 6). These markets being in contango puts downward pressure on prices. However, the US-China agreement on the 90-day tariffs moratorium caused most commodity prices to jump, with WTI Crude gapping up $1.50 on the Sunday evening open. The winter meeting of OPEC begins on Thursday to determine output. OPEC, along with Russia, is expected to announce production cuts to reduce the oversupply in the global crude oil market. Qatar has said it will leave OPEC in January; however, Qatar’s crude oil production is only about 600,000 bpd. 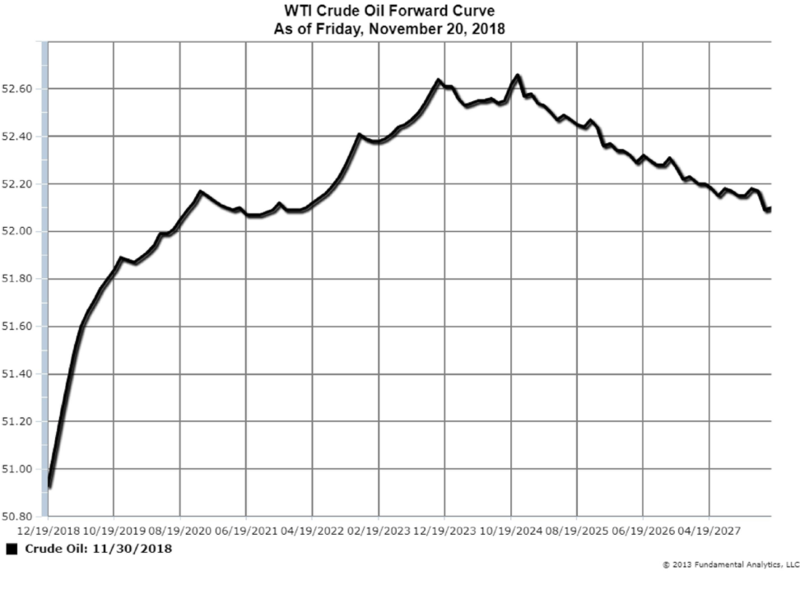 Analysts estimate that a production cut of more than 1 million barrels per day is needed to stabilize or increase prices. Consequently, in the short term, crude oil prices will be affected more by news headlines than fundamental supply/demand factors. So we recommend being on the trading sidelines until output cuts and their timing are officially announced.